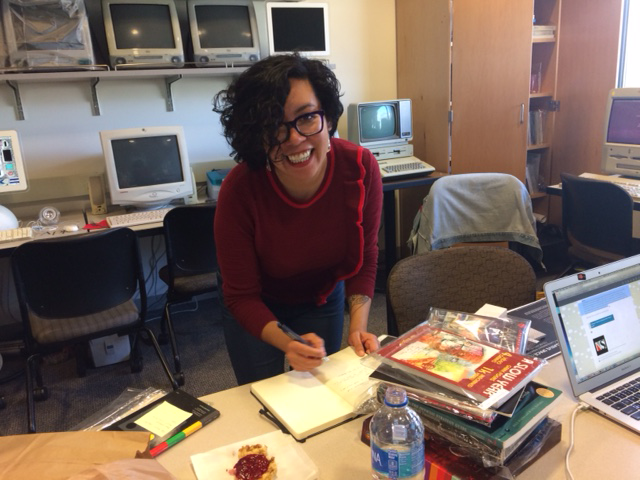 This photo, taken on Friday, November 9, 2018 in the Electronic Literature Lab (ELL) after Deena Larsen’s Traversal of her fiction anthology Samplers: Nine Vicious Little Hypertexts, exemplifies why a media archaeology lab like ELL is needed for digital preservation and archival research. What had become clear during the event was that the CD-ROM version of the work, marked as compatible for both Apple and PC computers, differed from the original Mac version Larsen personally produced beginning 1994. In fact, as we moved through this version of Samplers on both platforms––working side by side, lexia by lexia, link by link––Larsen and I came to realize just how different the work is in this version from what she had originally intended it to be. While at the 1993 ACM Hypertext conference in Seattle, WA, Larsen and e-lit artist Kathryn Cramer sparked the idea of a collection of little hypertexts, each sporting its own structure. In 1994 Larsen sent an early version of the collection––produced with Storyspace 1.2c––to Eastgate Systems, Inc., the company that had published her previous work Marble Springs in 1993. 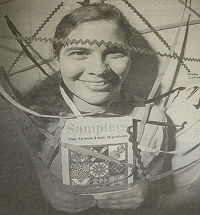 In 1995 Larsen showed this early version of Samplers at the 1995 ACM Hypertext conference in York, UK. That same year, one of the hypertexts from the collection, “Century Cross,” came out in The Eastgate Quarterly Review of Hypertext Volume 2, Number 2 bundled with Judith Kerman’s “Mothering” and Michael van Mantegem’s “Completing the Circle.” Larsen continued to work with the publisher through 1996 on the collection, finally publishing it on 3.5-inch floppy disk for Macintosh computers in 1997. She did not create the two versions that followed: the 3.5-inch floppy disk version for Windows and the CD-ROM version compatible for both platforms. These, according to Larsen, were produced solely by the publisher. In fact, Larsen reported during her visit to ELL that she had never even experienced the two later versions until she came into contact with them in my lab. The Mac version remains, according to her, the official version. 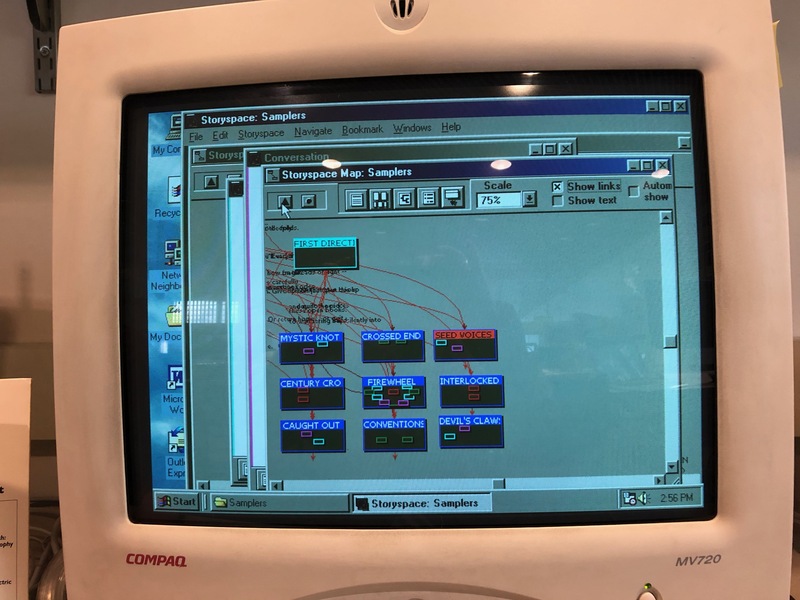 If you look back at the photo (above) you will see, on the left, the CD-ROM version of “Cross Ends” displayed on an Apple G4 iMac (circa 2002), commonly referred to as the “iLamp,” running Mac OS 10.3.9. 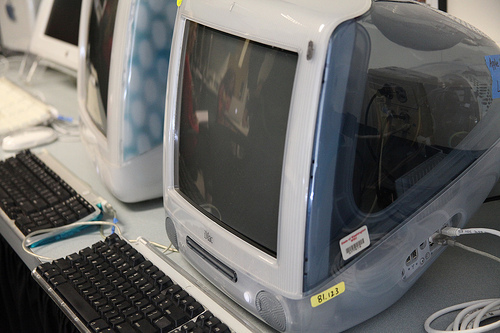 On the right, it is displayed on a Compaq PC (circa 2001) running Windows 98. While the Mac interface is clean and highlights the patch of the quilt associated with this hypertext, the PC version is clunky, framed within a box and dominated by a very busy and very gray menu bar. Larsen said that the way it displays on the Apple computer is the way she intended it to look to the user. But note something else. While the PC shows the hypertext structure of Samplers, certainly the hallmark of the work,  the Mac version does not. That functionality, available on the original Mac floppy disk, has been lost in the move from floppy disk to CD-ROM. If we consider that Samplers experiments with Larsen’s notion that “structure=meaning” , then a significant aspect of that exploration has been diminished with the CD-ROM version. Having access to all three versions of Samplers and reading the work on both platforms demonstrates clearly that our experience with a work of electronic literature can be impacted and influenced by hardware and software. 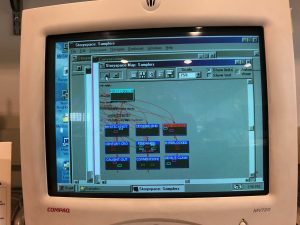 In this case, scholars reading the CD-ROM version of the work on an Apple computer would encounter the clean interface of the original Mac version but would miss the major aspect of the work’s functionality––its underlying structure. On the PC, scholars would encounter an interface more in line with a word processing software program than a work of art, but they would be able to experience the work’s structure. In truth, without a computer that reads any type of removable disk, scholars cannot access Samplers at all. It is lost to the public. Considering that it is the second major work by one of the most important electronic literature authors, this situation is nothing short of awful. Libraries that do collect media published on floppy disks generally do not make removable disks available to scholars out of concern for the works’ preservation. Some instead provide an emulation of a work. Since the version most likely available from the publisher today would be the CD-ROM version of Samplers,  libraries could very well be emulating and making this version available to scholars. This means that scholars would come away with an experience with the work different from what the author had envisioned them to have. 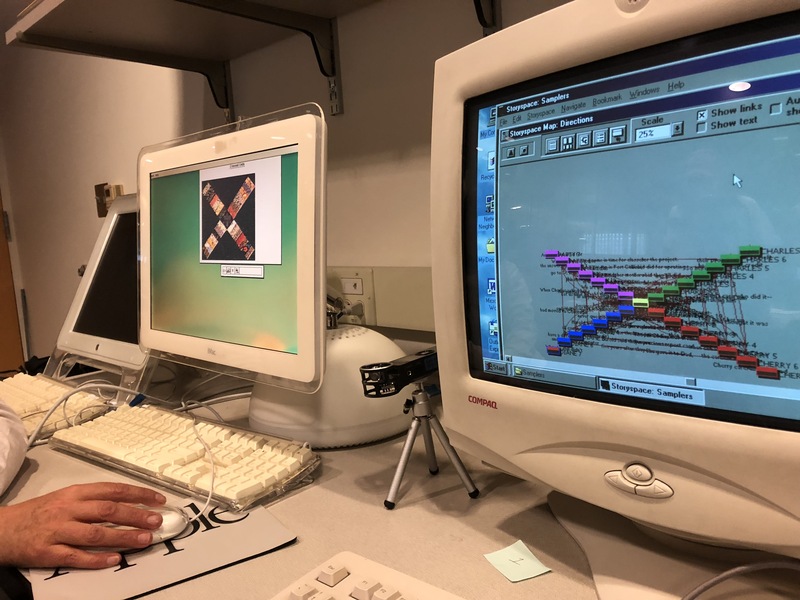 But if scholars had access to a media archaeology lab like ELL, they would be able to read the work in the original––on a Macintosh computer, circa 1997 with a floppy disk drive––and see the work in its full glory. It is only then that they would understand why Samplers is, as Susana Tosca claims, “an example of the use of structures with an aesthetic end, as the patterns (that we can see with the Storyspace map) give clues about the meaning that each story explores,”  or, as Leonardo Flores says, “show[s] how much attention [Larsen] dedicates to developing the structure of her hypertext works. 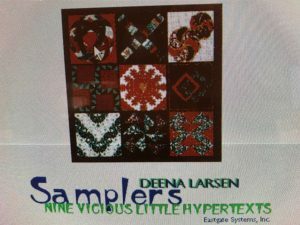 And as you might imagine, reading the stories in Samplers will lead you to discover links between the stories that stitch the blocks into a coherent narrative sampler quilt.”  Only then would scholars realize why Samplers is considered Larsen’s second major work of hypertext fiction. See Tosca’s review for Hipertula. Deena Larsen Interview, 9 November 2018. Rebooting Electronic Literature, Volume 2. It would be legal for libraries to emulate a work for which it owns a removable disk version as long as scholars visit the library physically to access the emulated version. Eastgate Systems, Inc. has not released Samplers on flash drive as it has Michael Joyce’s afternoon: a story, Shelley Jackson’s Patchwork Girl, or Mark Bernstein’s Those Trojan Girls. Susana Tosca. “Lyrical Quality of Links.” The Proceedings of ACM Hypertext 1999, 217-218. Leonardo Flores. “Deena Larsen’s Metaphorical Interfaces.” Hyperrhiz 11.